PROLOGUE: On the Valkyries' rock, three Norns spin the rope of Fate, recalling Wotan's days of power and predicting the end of the Gods. When the rope breaks they descend in terror to their mother, Erda, goddess of the earth. At dawn Siegfried and his bride, Brünnhilde, emerge from their cave ("Zu neuen Taten"). Though fearful that she may lose the hero, she sends him forth to deeds of valor. As a token of his love, Siegfried gives Brünnhilde the magic Ring he took from Fafner, and she gives him her horse Grane in exchange. Passionately they bid farewell as Siegfried sets off into the world (Rhine Journey). Götterdämmerung - Complete (Part 1) Orchestra and Chorus of the Bayerischen Staatsoper, Wolfgang Sawallisch (conductor) Brünnhilde: Hildegard Behrens, Siegfried René Kollo, Hagen Matti Salminen, Waltraute Waltraud Meier. Live recording: 1989. ACT I: In their castle on the Rhine, Gunther, Lord of the Gibichungs, and his sister Gutrune, both unwed, ask counsel of their half-brother, Hagen. Plotting to secure the Ring, Hagen advises Gunther to marry Brünnhilde: by means of a magic potion Siegfried can be induced to forget his bride and win her for Gunther in return for Gutrune's hand. The hero's horn announces his approach. Gunther welcomes him, and Gutrune offers him the potion. Remembering Brünnhilde, he drinks and forgets all, quickly succumbing to Gutrune's beauty and agreeing to bring Brünnhilde to Gunther. The two men swear an oath of blood brotherhood ("Blühenden Lebens"), and then depart. Hagen, left to keep watch, broods on his plot's success ("Hier sitz ich zur Wacht"). On the Valkyries' rock, Brünnhilde greets her sister Waltraute, who says Wotan has warned the gods their doom is sealed unless Brünnhilde yields the Ring to the Rhinemaidens. But Brünnhilde's new love for Siegfried is more important to her than concern for the Gods. She refuses to give up the Ring, and Waltraute rides off in despair. Dusk falls as Siegfried returns transformed by the Tarnhelm into Gunther's form. He tears the Ring from the terrified Brünnhilde's finger and claims her as Gunther's Bride. ACT II: At night, before the Gibichung hall, Hagen dreams of his father, the Nibelung Alberich, who forces him to swear he will regain the Ring ("Schläfst du, Hagen?"). As dawn breaks, Siegfried returns with cheerful greetings for Hagen and Gutrune: he has won Brünnhilde for Gunther. Hagen summons the vassals to welcome the king and his bride ("Hoiho, Hoiho!"). When Gunther leads in Brünnhilde, she is startled at seeing Siegfried; observing the Ring on his finger, she decries his treachery and proclaims Siegfried her true husband ("Heilige Götter!"). Still under the potion's spell, the hero vows upon Hagen's spear that he has never wronged her ("Helle Wehr! Heilige Waffe!"). Brünnhilde swears he lies, but Siegfried dismisses her charge and leaves with Gutrune. The dazed Brünnhilde, bent on revenge ("Welches Unhold's List"), reveals to Hagen the hero's one vulnerable spot: a spear in the back will kill him. Taunted by Brünnhilde and lured by Hagen's description of the Ring's power, Gunther joins the murder plot. The couples proceed to the wedding feast. ACT III: On the bank of the Rhine the three Rhinemaidens bewail their lost treasure ("Frau Sonne sendet lichte Strahlen"). Soon Siegfried approaches, separated from his hunting party. The maidens plead for the Ring, but he ignores both their entreaties and warnings. When the hunters arrive, Siegfried at Hagen's urging describes his boyhood with Mime (his Nibelung foster father), his slaying of the dragon Fafner and finally - after Hagen gives him a potion to restore his memory - his wooing of Brünnhilde ("Mime hiess ein mürrischer Zwerg"). Pretending indignation, Hagen plunges a spear into the hero's back. Remembering Brünnhilde with his last breath, Siegfried dies and is borne off (Funeral Music). At the Gibichung hall, Gutrune nervously awaits her bridegroom's return. Hagen tells her Siegfried has been killed by a wild boar, but when his body is carried in she accuses Gunther of murder. Hagen admits the crime ("Ja denn! Ich hab'ihn erschlegen"). Quarreling over the Ring, Gunther is killed by Hagen, who falls back in fear when the dead Siegfried raises his hand. Brünnhilde, entering, orders a funeral pyre for Siegfried ("Starke Scheite"). She condemns the gods for their guilt in his death, takes the Ring, and promises it to the Rhinemaidens. Placing it on her finger, she throws a torch onto the pyre and joyfully rushes into the flames. 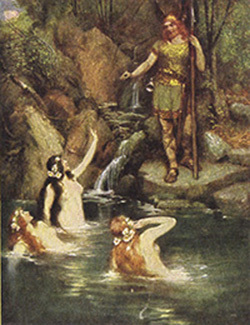 As the river overflows its banks and the Gibichung hall is consumed, the Rhinemaidens, dragging Hagen to his death, regain their gold, at last purified of its curse. Flames engulf Valhalla, leaving a human world redeemed by love. Götterdämmerung - Complete (Part 2) Orchestra and Chorus of the Bayerischen Staatsoper, Wolfgang Sawallisch (conductor) Brünnhilde: Hildegard Behrens, Siegfried René Kollo, Hagen Matti Salminen, Waltraute Waltraud Meier. Live recording: 1989.